It’s been a long time since I’ve had a vacation that included riding. 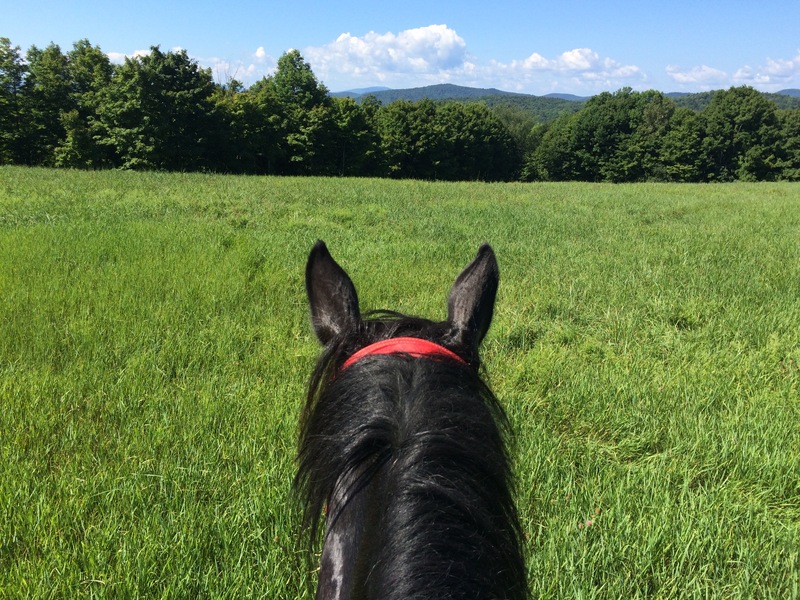 I am grateful that my family put up with me disappearing for hours at a time to commune with my horse, my horse friends and the great outdoors. Zelda and I had a lot of fun and we came back with a few important lessons. Riding with one of our new friends. After a scorcher of a summer in Massachusetts, we both enjoyed seeing all the green. It would take a long time to get tired of the views. It is just as hard to come down a hill as it is to go up. Sometimes harder. Zelda and I are not very good at going down technical hills. I hiked with my families in the afternoons and I completely understood her reluctance. We did get better during the course of the week. Miles are longer in Vermont. That’s because you have to factor in the vertical rise. Every day you get a little fitter. I noticed that Zelda found it easier to climb the hills pretty quickly. I guess my fitness level also improved but I still found the hiking to be tough. Riding doesn’t get old. Everyone I rode with last week had a big smile on their face. Every day. I know it amazes my family that I can go out and ride every day and not get tired of it. I’m just lucky like that. The horse community is incredibly welcoming. I rode with old friends and new friends. It’s wonderful to have something in common that you all feel passionate about. There is an easy camaraderie. After all, who doesn’t want to talk about horses? Horses make friends easily, too. 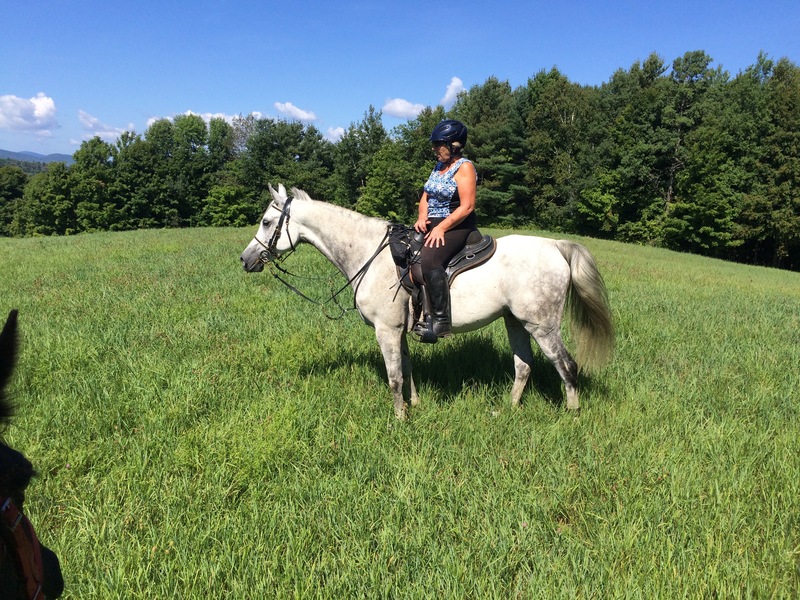 There’s nothing like a three hour ride (or trailer ride) to help horses bond. Zelda made a lot of new friends on the trip, as evidenced by the whinnying and carrying on when we left one new herd for another. The Morgans at her barn, particularly the one in the stall next to her, were very vocal in their welcome. Riding is not the most dangerous thing we do. On the last day of our vacation, I missed a stair carrying stuff to the car. I went sprawling, broke a glass coffee pot and ended up bruised and bleeding. I had survived countless hours in the saddle and a few hikes. Next time I’ll make my kids carry all the stuff. It’s good to push the envelope. Every so often it’s good to get out of your comfort zone and try the things that make you nervous. Personally, I hate trailering long distances. Lucky me, I got to drive the trailer to Vermont in torrential rains (more on that later). And I asked Zelda to tackle some trails (on her own) that probably didn’t seem like a smart choice to her. It made us both a little bit braver.